More than a century before the Emancipation Proclamation, slaves from the British colonies followed the original "Underground Railroad"-- not north, but south to the Spanish colony of Florida. 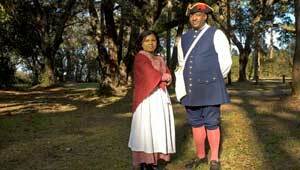 Fort Mose, just north of St. Augustine, was the first free African American settlement in America. Today, the site is a National Historic Landmark on the Florida Black Heritage Trail. Its location on the Intracoastal Waterway just north of St. Augustine also makes it an important stopping point for birds on the Atlantic Flyway, providing habitat for many species of wading birds. In 2004, TPL worked with the Fort Mose Historical Society, St. Johns County, and the City of St. Augustine to acquire an eight-acre addition to Ft. Mose Historic State Park. The land will be used to construct a much-needed interpretive and visitors center for the park.